Cement is a fine binding powder that is never used alone, but is a component of both concrete and mortar, as well as stucco, tile grout, and thin-set adhesive. Mortar is composed of cement, fine sands and lime; it is used a binding material when building with brick, block, and stone. Concrete is a very strong structural building material composed of cement, sand, and larger aggregate (gravel). Cement is the binding element in both concrete and mortar. It is commonly made of limestone, clay, shells, and silica sand, with limestone being the most prevalent ingredient. These materials are crushed and combined with other ingredients (including iron ore), and then heated to about 2,700 F. This material, called clinker, is ground into a fine powder and packaged to use for mixing various cementitious building materials, including mortar and concrete. You might see cement referred to as Portland cement. This is because it was first made in the 1800s in England by a mason, Joseph Aspdin of Leeds, who likened the color to the stone from the quarries on the island of Portland, off the coast of England. Today, Portland cement remains the most common type of cement used in building materials. It is a type of "hydraulic" cement, which simply means that it will set and harden when combined with water. Concrete is a complete building material used for foundation walls, concrete slabs, patios, and many other masonry structures. It is uniquely versatile because it starts out as a simple, dry mixture, then becomes a flexible, semi-liquid material capable of forming into any mold or shape, and which dries into the hard-as-rock material we know as concrete. In many concrete structures, metal reinforcement, such as wire mesh or rebar, is added for strength and to minimize the cracking that can occur in solid concrete. Concrete is composed of cement, sand, and gravel or other fine and coarse aggregate. The addition of water activates the cement, which is the element responsible for binding the mix together to form a solid. You can purchase ready-made concrete mixes in bags that combine cement, sand, and gravel so that all you need to do is add water. These are useful for small projects, such as anchoring fence posts or building small pads. 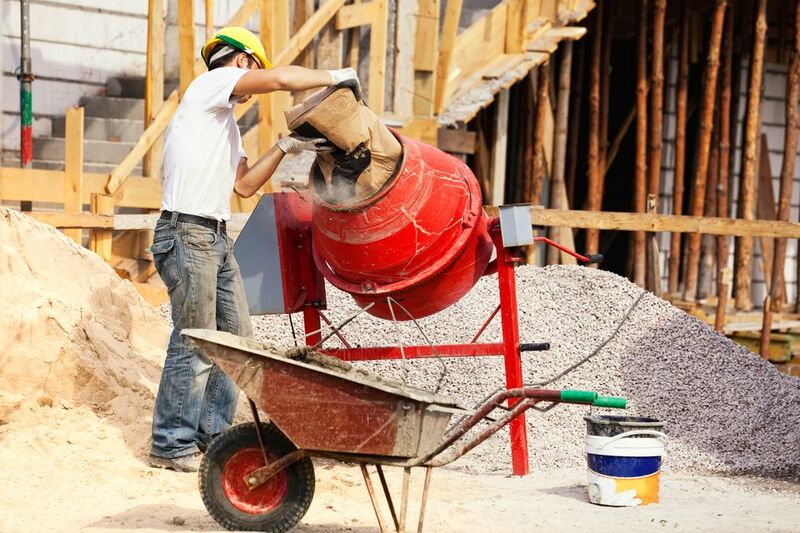 For large projects, you can either buy bags of cement and mix them with sand and gravel yourself, using a wheelbarrow or other large container; or you can order premixed concrete delivered by a truck (commonly called "ready-mix" concrete). Mortar is yet another building material composed of cement, which in this case is mixed with fine sands and water, with lime added to improve the durability of the product. Adding water to this mix activates the cement so that it hardens, or cures, just as with concrete. Mortar is not as strong as concrete and typically is not used as a sole building material. Rather, is it the "glue" that holds together bricks, concrete block, stone, and other masonry materials. Mortar is commonly sold in bags, in a dry pre-mixed form that you combine with water. It can also be mixed on-site, using a cement mixer or simply mixing with a shovel or hoe in a wheelbarrow or mixing tub. There are many different types of mortar designed for different applications. When working with brick and other masonry units, it is important to use the right type of mortar for the masonry, as some mortars are too hard for some types of masonry and can crack if used improperly. Grout is a similar product that can be seen as a form of mortar, but formulated without the lime additive. Mortar has a higher water content to allow it to flow and fill gaps between ceramic and stone tiles. Because of its high water content, grout is not a binding material, but serves merely to fill gaps. Thin-set is a related product made of cement and very fine sands, along with a water-retaining agent such as an alkyl derivative of cellulose. It is used to attach ceramic and stone tile to a substrate, such as cement board. Some thin-sets have latex and polymer additives to increase bonding strength. Thin-set has a pronounced adhesive quality, and is sometimes referred to as thin-set adhesive.